The duality of the mental powers of the Geminian Moon can often be expressed in the ability to adapt their responses to situations in a way they think should fit the facts, that is, they act in a way others expect them to act, or they imitate the same behavior as others. This gives them the appearance of emotional coolness or non-involvement. In relationships, Geminian Moon people do not think of the physical, or the stability aspects of the relationship in question. Instead, they view the relationship as one of many exciting experiences. The relationship in question will need to wait for the signal that the twins moon sign has singled this relationship out as special and unique. Enthusiastic and exciting are what this moon main emotion. Geminians tend to do and say what seems appropriate as if it were not really happening to them. Thus is displayed the dual side of Geminians: in spite of their appearance as analytically detached, most of them are loving and loyal in relationships. 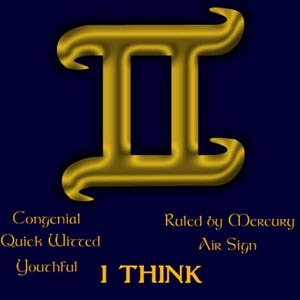 As lunar Air sign personalities, those with Moon in Gemini can sometimes take their intellectual approach too far. Constant analyzing, rationalization, and acting as though they have already experienced something instead of just thinking or talking about it, can prevent them from ever doing it. Gemini Moons are talkative, mentally alert, and curious about everything. When Geminian Moons need emotional healing, you will find them in bookstores, libraries, or surfing the Internet. Knowledge and mental pursuits comfort them much like the Taurean creature comforts of home soothe the Taurean soul. Gemini Moon personalities are emotionally adaptable. A dual-natured flexibility allows them to say or do one thing with apparent ease, even though what they really think and feel may be quite different. Geminians have a nickname here at Indigo Ray as the 180s. One day they can be on the affirmative side of an issue and the next day they can be on the negative, all with sound logical and rational thinking. They instinctively understand what others want to hear and know what to do to please them, but they dont always know how to make themselves happy. Although quite willing to discuss others, they can be secretive about themselves. Their outer personality may be bright and optimistic, but they can harbor inner feelings of loneliness. Communication is key to unlocking the secret of the emotional Gemini moon. Famous Women Geminian Moon Signs: Roseanne, Joan Baez, Brett Butler, Bette Davis, Mitzi Gaynor, Darryl Hannah, Goldie Hawn, Muriel Hemingway, Ann Jillian, Madeline Kahn, Gwyneth Paltrow, Gilda Radner, Jessica Savitch, Patricia Schroeder, Brooke Shields, Grace Slick, Shirley Temple Black, Queen Victoria, Barbara Walters, and Shelley Winters. Famous Men Geminian Moon Signs: Jason Alexander, Fred Astaire, Jack Benny, Victor Borge, John Cage, Jim Carrey, Jackie Chan, Howard Cosell, Roger Daltry, Kirk Douglas, M. C. Escher, Sigmund Freud, John Goodman, Gene Hackman, Phil Hartman, Danny Kaye, Groucho Marx, Van Morrison, Leonard Nimoy, Omar Sharif, and Spencer Tracy.